Farrar, Straus and Giroux (BYR), 9780374301644, 256pp. 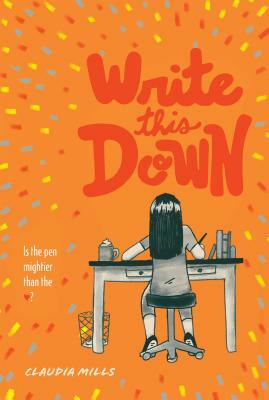 Twelve-year-old Autumn loves to write, and she can't wait to grow up and be a published author. She finds inspiration all around her, but especially in Cameron, the dreamy boy in her journalism class who she has a major crush on. When her older brother Hunter makes fun of one of her most personal poems—about Cameron—Autumn decides to prove that she is talented enough to become a published author. But when her essay about Hunter wins a contest, and her dream of being published is finally within reach, Autumn has to decide whether being a real writer is worth the cost of sharing her family's secrets and hurting people she loves. This touching story is sure to resonate with readers, and prove that the heart is mightier than the pen. Claudia Mills is the acclaimed author of many books for children including the Franklin School Friends children's book series, including Cody Harmon, King of Pets and Simon Ellis, Spelling Bee Champ. She lives in Boulder, Colorado.